On Wednesday 9/19 I was watching my son play football and received a call. 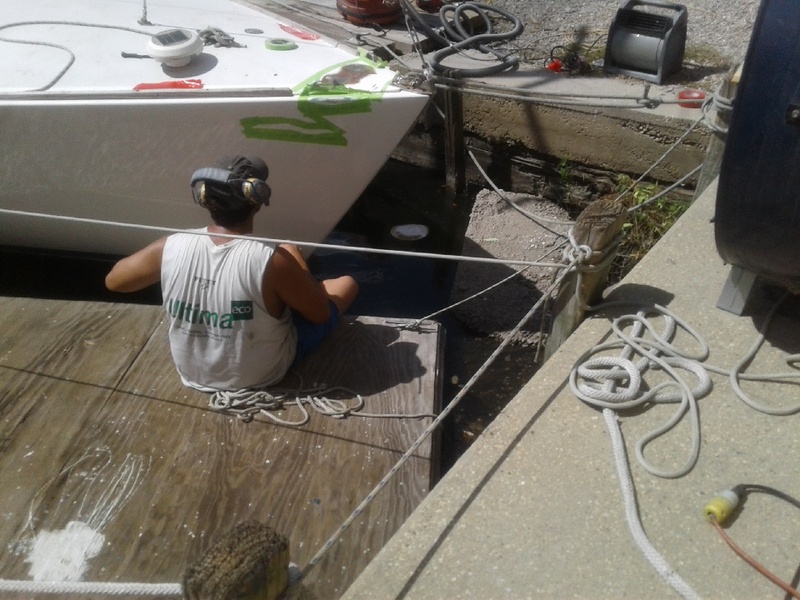 One of my crew members aboard J/30 Zephyr said "Dave what are you doing"? I said watching a football game, I though you guys were racing Zephyr". Randall said "first I want to say no one was hurt. A boat hit us bow to bow at the start." I said material things don't matter I am thankful no one was hurt. Send photos of damage, I will meet you at the New Orleans Yacht Club after game". 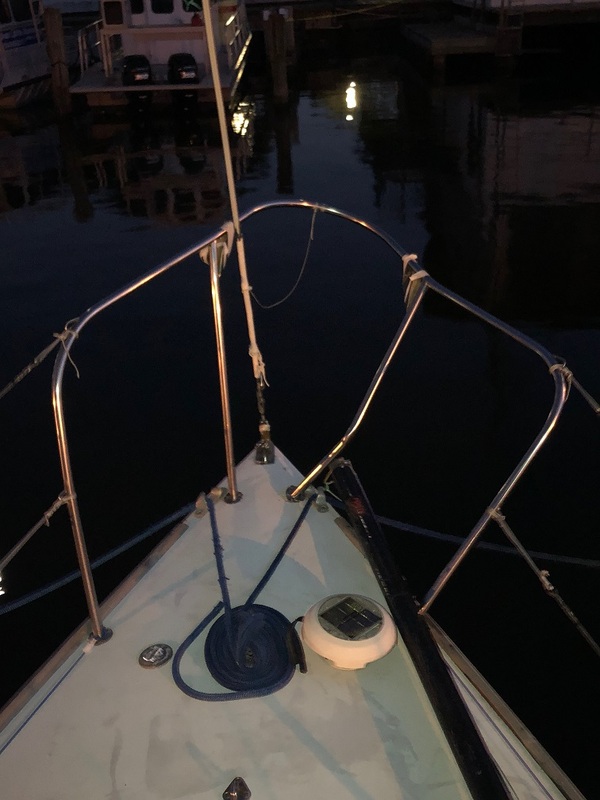 A friend sailing on a Wavelength 24 was over early and headed back to the starting line with hopes of time to "dip" back below the line. They discovered there was no room and hit J/30 Zephyr V2.0 Hull # 87 head on. Damage was limited to a bow pulpit, carbon fiber spinnaker pole, some fiber glass work and paint including non skid. Two of the sailors that night including the crew member who called me and the helmsman had won a previous US Men's Sailing Championship. The nurse who screamed before contact was encouraged to take her skills to Hollywood. She experienced some minor PTSD during the next race when several boats headed at us during a start. This new fear will works its way out after a few more races. 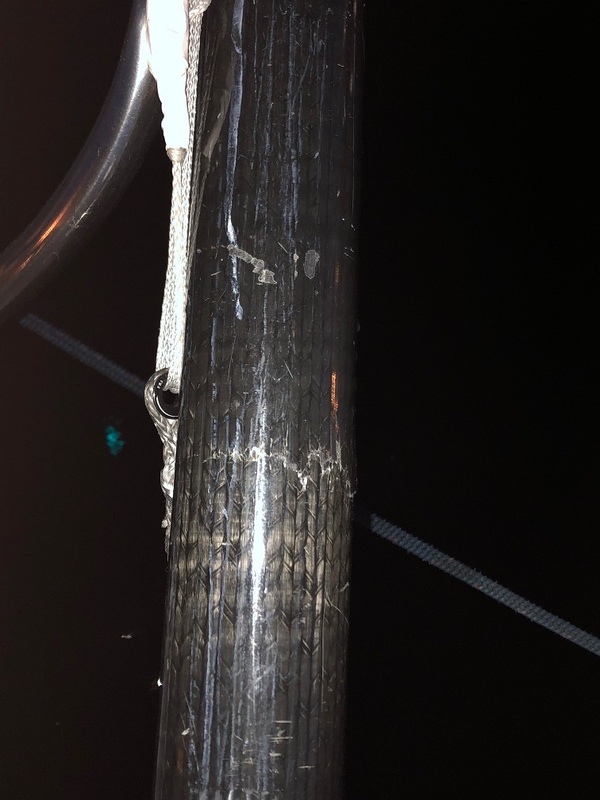 Earlier this year, the GYA Women's Championship team (see photo on front page) broke the bow pulpit rear leg weld point on port side when the girls "hiked too hard". 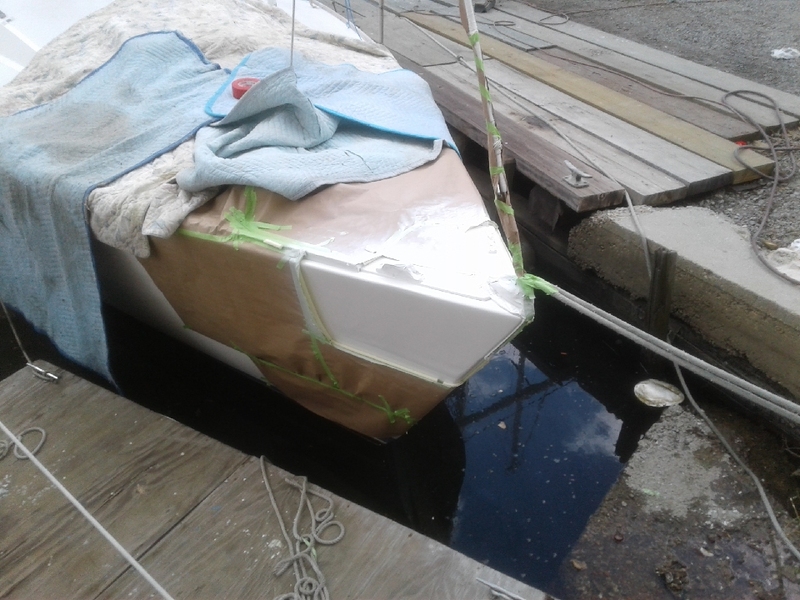 We tack welded the leg in the correct position and unbolted her from the hull. The rail was taken to Nick's Prop Stop he welded all four legs, the pulpit was stronger then ever and looked brand new. I credit this for preventing hull damage on starboard side as the fiber glass broke on top of deck vs weld point. This took much of the load. 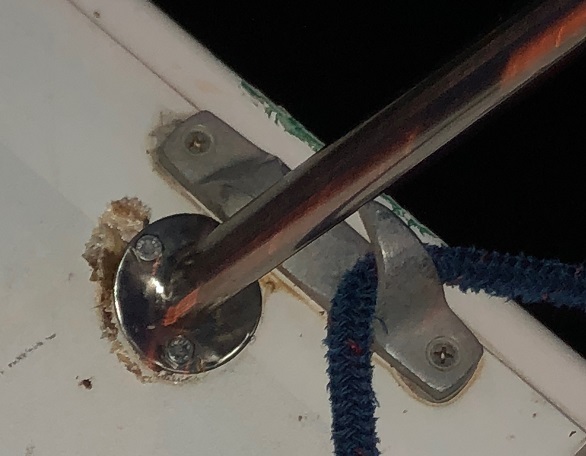 The weld points DID NOT break causing the fiberglass to crack where the bow rail was fastened to deck on front two legs. 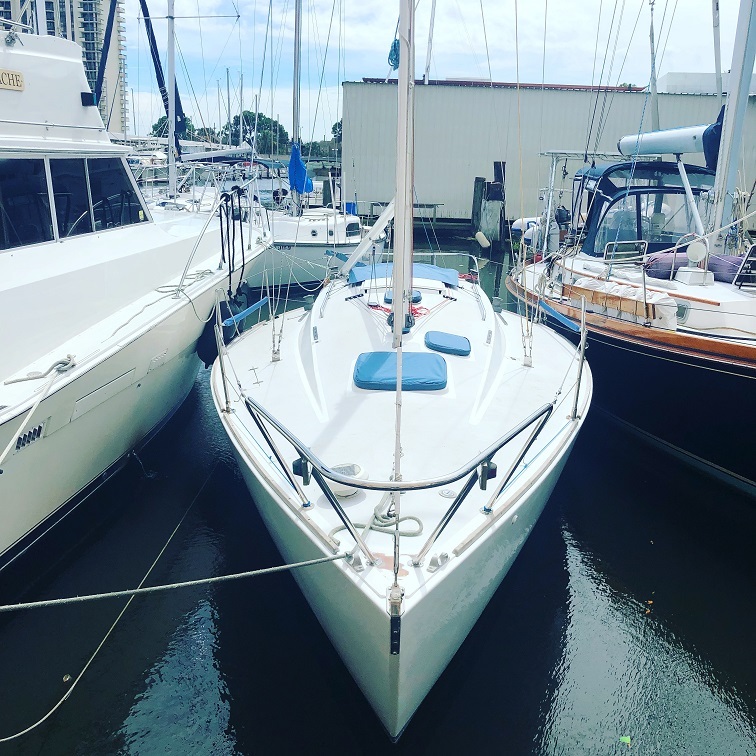 The carbon fiber spinnaker pole as you know extends beyond the hull a few inches typically on starboard. This is the area that the Wavelength hit us. The carbon pole loaded up and snapped causing a loud noise upon impact. The pole absorbed much of the impact load as well. Energy was transferred to the starboard side chain plate. The impact occurred between 7:05 and 7:06 PM central time. Crew member, Randall called me at 7:07 pm. From the Destrehan High School Wildcat stadium stands, I posted "Zephyr V2.0 Hull #87 needs a bow pulpit. Please e-mail dave@j30.us" at 7:33 PM. Several people responded. Steve in Rhode Island sent a message, "I have Falcon's bow rail". I purchased, the bow rail by noon on 9/20. 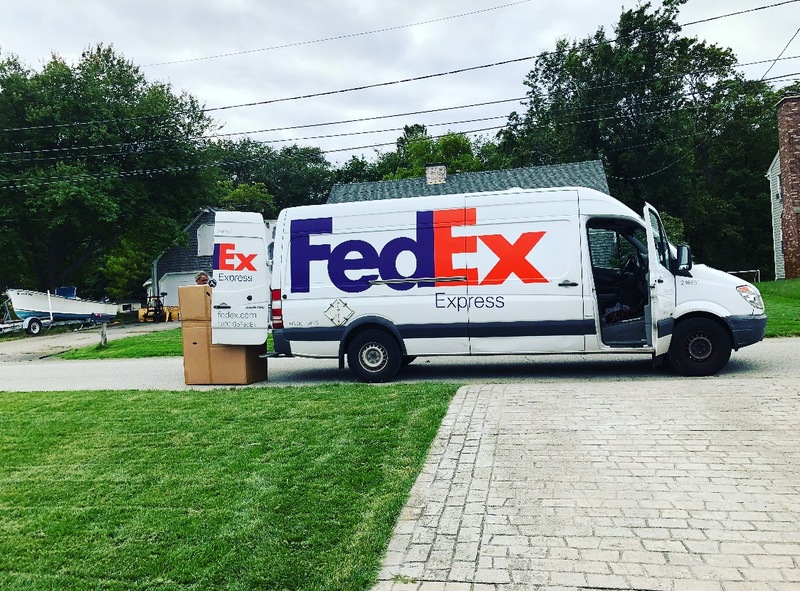 The rail was shipped on Friday 9/21 and arrived on Tuesday 9/25. 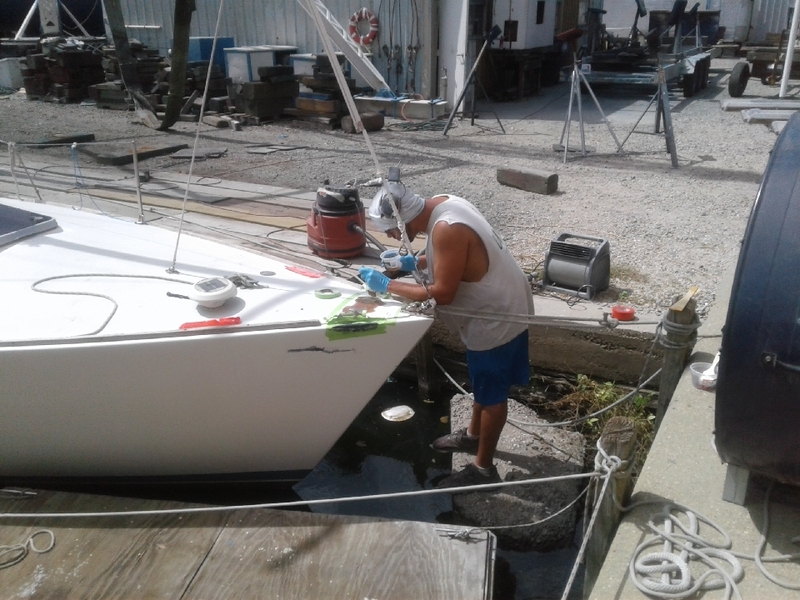 Sintes Boat Works started fiberglass repairs on 9/20, painted primer on 9/21 and painted Awlgrip Stark White on Saturday 9/22. The new rail was installed on 9/25 just in time to race on 9/26! Another J/30 owner of Toybox offered to loan us a spare spinnaker pole as our original had a broken end. Look for a future post asking for an 3" legacy style end. The weather didn't cooperate the next week, so we painted the non skid color Awlgrip Chevy White at a later point in time. The camaraderie from J/30 Class and the boat yard was very productive to allow us to get race ready in a week. This is an amazing story so I wanted to share a few photos and quick video of the collision. Special thanks to all who assisted to repair Zephyr in time for racing! Last edited by David Erwin; 10/15/18 01:01 AM. Awesome story. I'm glad no one was hurt.